Watt's Up? : What is a reverse protection diode and what does it do? What is a reverse protection diode and what does it do? A reverse protection diode is used on the output of a power supply to protect the power supply from damage due to an externally applied reverse voltage. Most power supplies have a polarized electrolytic capacitor (or several) across the output terminals. These caps help to filter ripple and noise on the output and provide a charge reservoir to reduce voltage sags and surges due to large load current changes. Electrolytic caps can withstand some reverse voltage, but not much. About 1 V to 1.5 V is the most they will tolerate without venting or worse…exploding! The reverse protection diode limits the reverse voltage to a diode drop thereby protecting the output caps. The diode is typically rated for the full output current of the power supply it is protecting. Adding to the diode drop, there can be some more small voltage drops due to current flowing in wires, tracks, current monitor resistors, output filter inductors, switching transformer windings, etc. 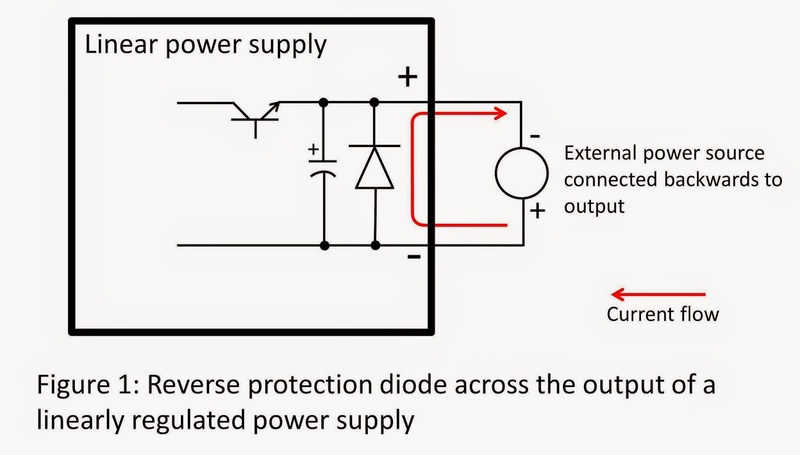 In a linearly regulated power supply, the reverse protection diode must be added to the design with the cathode connected to the plus output and anode connected to the minus output. See Figure 1. 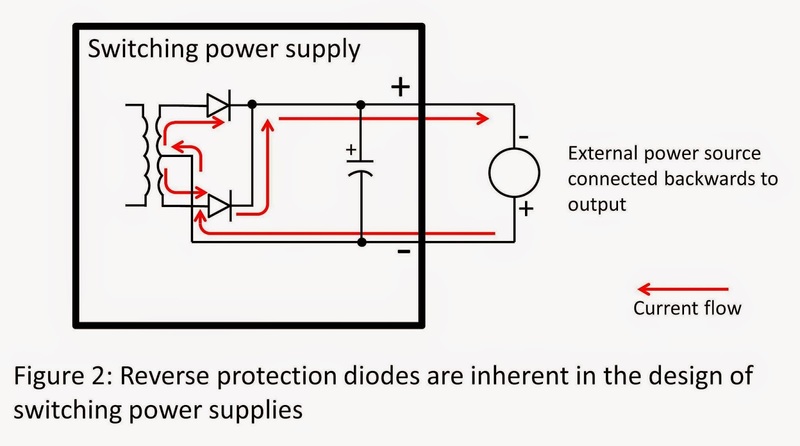 In a switching power supply, the reverse protection diode(s) is (are) an inherent part of the design. See Figure 2. But where does reverse voltage come from? During normal operation, reverse voltage does not occur on the output of a power supply (unless it is a bipolar power supply which does not use polarized caps on its output…see this post). The power supply internal circuitry typically cannot produce reverse voltage on the output even if a failure occurs inside the power supply. So a reverse voltage has to be applied from an external source of power. For example, if you use two power supply outputs in parallel and inadvertently connect them to each other backwards, a reverse voltage would result. 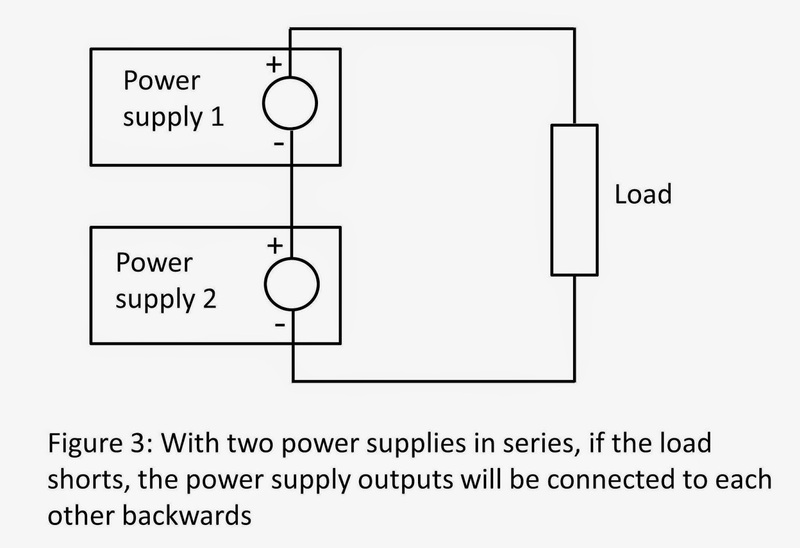 Another possibility can occur when two power supply outputs are connected in series. If the load across the series combination shorts, the two power supply outputs will be connected to each other backwards. See Figures 3 and 4. 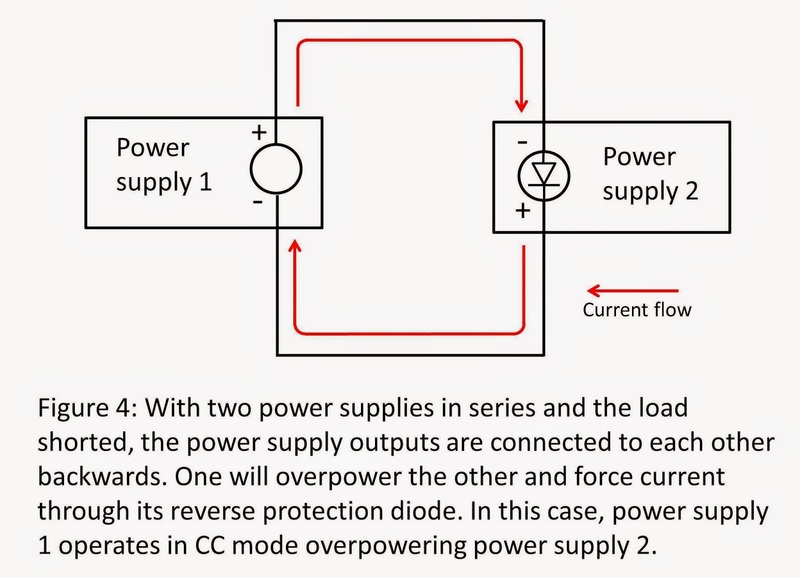 The reverse protection diode of one of the power supplies will conduct all available current from the other power supply forcing it into constant current (CC) operation and limiting the voltage to a diode drop (plus any additional small drops mentioned above). 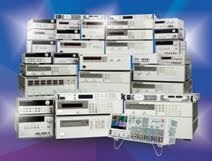 So rest assured that your Keysight power supply is protected against reverse voltage if something unexpected happens! Thanks for post. Think you guys may find this content interesting as well.